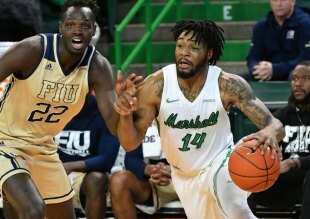 HUNTINGTON, W.Va. – Herd men's basketball (17-13, 10-7 C-USA) overcomes its second straight double-digit deficit in a 94-78 win over FIU (18-12, 9-8 C-USA) at the Cam Henderson Center Wednesday night. "The pod system worked for us and against us," fifth-year head coach Dan D'Antoni said after the third game of bonus play. "If we win Saturday, we'll have one of the top-three records in the conference, but it gave us 12 days of rest. You can see the difference in the legs (from where we were before after the rest)." Marshall's victory was another team-effort lead by five players with 10 or more points and four with at least seven rebounds. C.J. Burks led the way with game-highs in points and assists with 21 and seven, respectively. The senior also shot 50 percent from field, nine-for-18, and made four attempts from three-point range. Taevion Kinsey and Jon Elmore each had 18 points. Elmore added eight rebounds, six assists and a team-high two blocks and two steals to his stat line, while Kinsey had four rebounds and a pair of helpers. The freshman guard also made seven of his 11 field-goal attempts and made all four of his free-throws. Darius George and Rondale Watson added 14 and 10 points for the Herd, respectively, while each brought down eight boards. Jannson Williams had nine points to go with seven rebounds, despite only playing just three minutes in the first half. Having led for the better part of the first seven minutes of the game, Marshall trailed for the first time at the 12:24 mark when the Panthers took a 20-18 lead. With 4:21 remaining in the opening half, the Herd trailed by 12, 42-30. In those last few minutes, Marshall went on a 17-4 run to lead 47-46 at the break. FIU would briefly regain the lead at the beginning of the second half, but four separate runs of at least seven points would put the Herd out in front for the remainder of the ballgame. Marshall went 35-of-77 from the field, 45 percent, while making 10 of its 31 attempts from beyond-the-arc. The Herd held FIU to just two-of-18 on three-point attempts in the game. - The win marked the 90th of D'Antoni's career. - C.J. Burks moves into eighth all-time in steals with 143 career takeaways. - Jon Elmore needs 86 points to pass Skip Henderson for most points in program history. - Taevion Kinsey has had five consecutive games of 10 or more points. - Marshall is 9-1 when scoring at least 90 points. - The Herd is 4-0 when having at least five players with 10 or more points. - Tonight was the first time Marshall had finished a game tied with its opponent in rebounds. - With the win, MU locked itself in the sixth seed for the conference tournament and will face Rice next Wednesday (Mar. 13) at 10 p.m. EST in Frisco, Texas. Marshall hosts FAU on Saturday at Noon for Senior Day. The Herd will honor Christian Thieneman, Rondale Watson, C.J. Burks and Jon Elmore in a pregame ceremony.